It was the same conference room. The exact same venue, but it was like walking into another space from the one I had sat in the previous two days. For 48 hours I attended my 5 yearly Baptist ministry refresher conference, followed (purely by coincidence) by the annual pioneers ‘breakout gathering’ which is a cross denominational conference. Both at the same conference venue. Of course I knew the content would be different, the speakers and workshops geared up for a different audience; but what made it distinctly and surreally different was the way ‘stuff was done.’ Don’t get me wrong both conferences had fine content which was delivered on the whole, very well. But moving from one to the other was slightly odd. The power of the lectern. 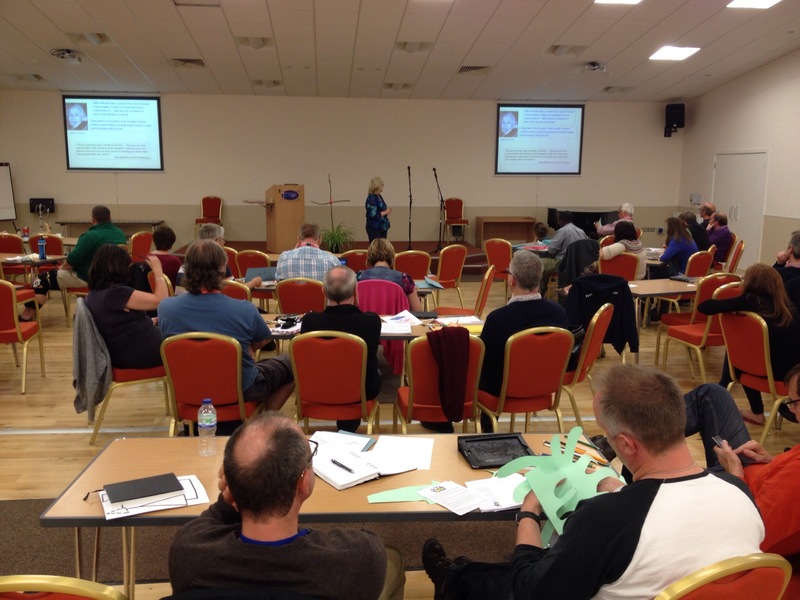 At the first conference all presentations, led worship, announcements and teaching took place behind a large wooden lectern, which was sandwiched in-between two large tables. This was like a long line of barrier on a stage from which the ‘presenter’ spoke from behind. At the second conference the lectern only featured once, as a means of Olive Drane propping her laptop on. All the rest of the communication happened without a barrier, and the body language visibly seen helped a great deal for the communicator. It also meant discussion and questions were easier to manage. The power of how you arrange the chairs! The first conference had chairs in straight rows (apart from the last session for communion where the chairs were put at an angel. The straight lecture Theatre style of chairs suited the presentations for this conference. When I walked into the next one the chairs where randomly arranged around tables. This created an informal atmosphere, I could place my coffee on the table and I even got my art materials out to paint within one of the sessions. The table facilitated all this, as well as good discussion and debate around the tables. The first conference had suburb teaching, I got a great deal out of it. Most was delivered monologue style, the second included painting, drawing, cutting stuff out, songs, discussion, questions, poetry and listening to one another. This connected with my learning style, which certainly needs engagement and variety. Now, I must stress this blog isn’t a critique of what was taught, rather than a critique on teaching styles. 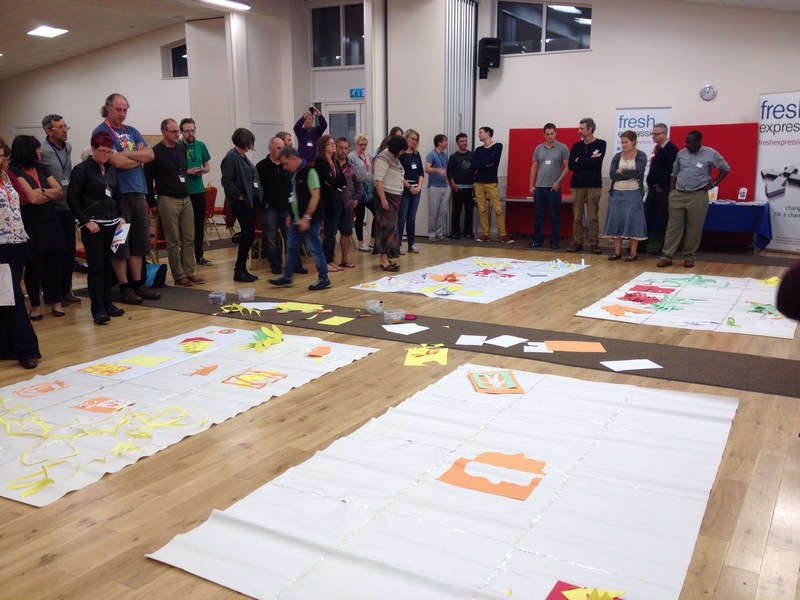 Both had excellent and poor teaching in my opinion, but the pioneer gathering used a variety of creative learning styles which I engaged with and it caught people’s attention. It was far more experience orientated. The power of the arts. 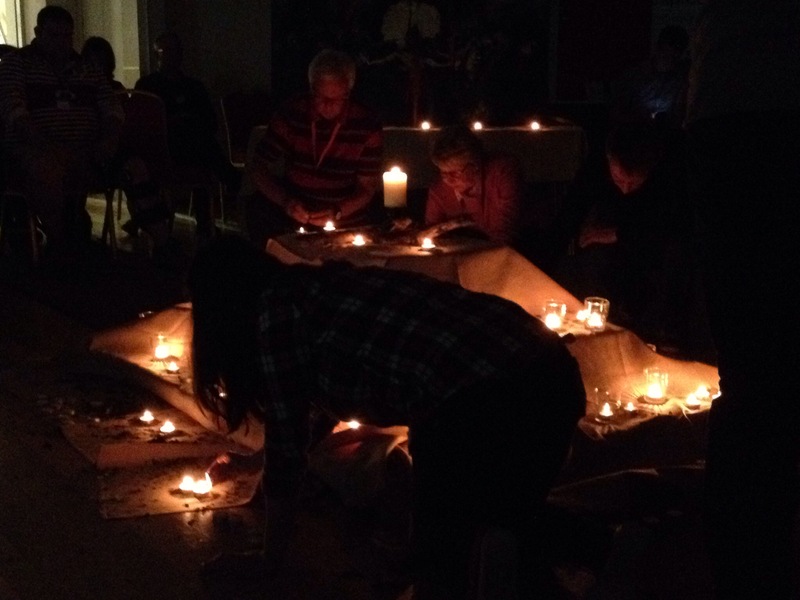 The role the arts have in teaching us about God and how to engage with people had a prominent role in the second conference. Take this image for instance. It disturbs me and makes me uncomfortable. 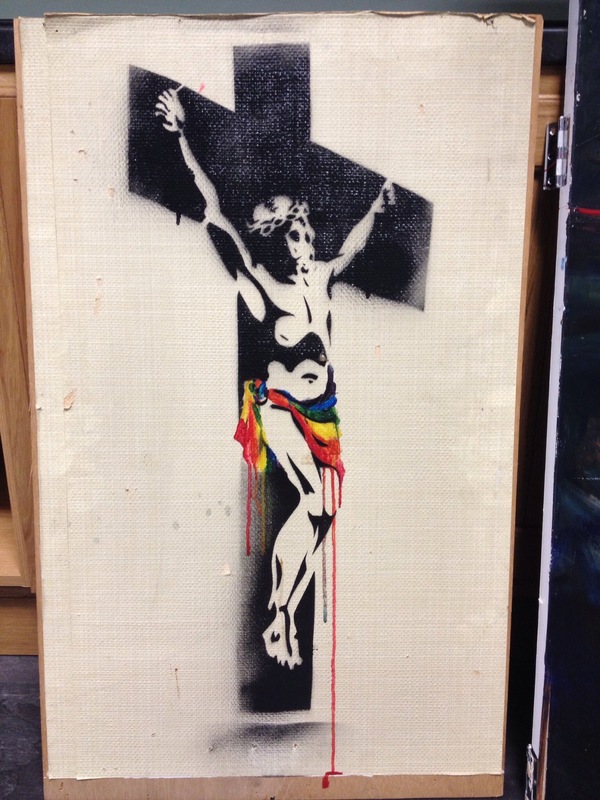 It was painted by Revd Richard Stott as a prayer for hurting people who are part of the gay and lesbian community. It promoted some good discussion. The role the arts have to teach us and help us engage is vital, I believe, for learning. I hope that some of the aspects of how we do what we do in a pioneer context can influence the culture of my Baptist family union. Thanks for your honesty in sharing this. Very helpful and insightful. I’m interested to know where the angels sit? You write “The power of how you arrange the chairs! The first conference had chairs in straight rows (apart from the last session for communion where the chairs were put at an angel.” I’m not being facetious, but I’m thinking of the lovely passage in “This Present Darkness” by Frank Peretti where the young Minister goes into his little Church to pray of an evening and the angels gather around him, and his heart is strangely warmed (as he perceives it) but what we see is the entire array of angels joining in with his prayers and worship of the Father and glowing fiercely brightly. When we meet we need to make space for them. Perhaps the latter of the two Conferences did this rather better? He he! Nice one Bob. I looked at that word Angel and thought, hang on a mo I’ve spelt that wrong… And then thought nah, its right!